Easy to use, better than toothpick. DENTIST LIKE CLEAN, EVERYDAY! Base Dental Co. replacement heads have been specifically designed for a deeper clean and assist with flossing to give you that dentist like clean everyday. We only use the best FDA Approved Dupont Tyne Bristles in order to provide healthy and clean brushing for your teeth and gums. 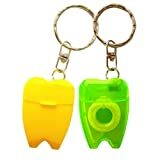 PROMOTES HEALTHY TEETH & GUMS: Thoughtful design to provide the utmost protection for teeth and gums. With comfort & function in mind our heads will aid in reducing plaque, bacteria, cavities and also decreases the chance of disease such as gingivitis; unlike manual toothbrushes. HIGHLY COMPATIBLE & FITS ALMOST EVERY ORAL B TOOTHBRUSH MODEL: Compatible With standard Oral B Rechargeable handles and those with bluetooth connectivity. Genius, Vitality Precision Clean, Vitality Dual Clean, Professional Care, Professional Care SmartSeries, TriZone, Advance Power, Pro Health, Triumph, 3D Excel, Plak Control 3D, Duo, Travel, Triumph Professional Care, Triumph, Sensitive Clean and Interclean. TWO YEAR SUPPLY: Dentists recommend changing your toothbrush at least every 3 months. Our reminder indicator bristles will fade from blue to white to notify you that its time to change. With our 8 packs you will have enough heads to last you for two years before needing a refill! Get yourself & the family a Base Dental Co. 8 pack today! Our toothbrush heads are ideal for men, women and children! SATISFACTION GUARANTEED: All of our products come with a 100% satisfaction guarantee or your money back! Your satisfaction is our number one priority! For a cleaner brighter smile! Base Dental Co. soft bristle Floss Action heads are the perfect fit for sensitive gums. With side-to-side sweeping movement, our bristles dislodge food particles making for a cleaner smile & fresher breath. With Oral-B being the best toothbrush brand, our heads have been specifically designed to be the premium alternative for your Oral B brush heads. Your teeth & gums with thank you! For the best oral health use Base Dental Co. Designed specifically to efficiently clean & remove plaque as well as prevent gum disease such as gingivitis. Enhance your brushing Experience today! – Up to the task: Aids in superior stain & plaque removal. – Premium Quality: Made from FDA approved premium materials. Our soft & durable Dupont Tynex bristles provide better cleaning & overall oral hygiene. -Time Saver: Up to 7000 head rotations per min leaving a bright smile in no time. -Great for gums: Sensitive to gums & highly recommended by dentists for those who suffer from receding gums. -Manual Vs Electric: Our heads remove up to 2x more bacteria & plaque than a regular manual toothbrush! -Family Friendly: Our toothbrush heads are ideal for men, women & children! STOP PAYING TOO MUCH FOR TOOTHBRUSH HEADS!!! Reward yourself with that dentist fresh like clean everyday! Professional Dental Water Flosser – Rechargable and Cordless – Oral irrigator with 3 Modes. Perfect for Teeth Cleaning and Braces – 4 floss tips & 4 hygiene tools included. HIGH-PRESSURE WATER FLOSSER – 5x More effective in eliminating the surface stains and food debris between the teeth. Dental Duty Rapid Flosser comes with a 360° rotating nozzle which provides deep cleaning for cavity prevention, plaque control, tartar control, whitening, gum care, and sensitivity relief. RECHARGEABLE AND PORTABLE: 240 ml high capacity water tank build with anti-leakage technology for easy storage and travel. This Aqua Flosser fully charge will last for weeks of continuous use – Safe 1500mA LITHIUM BATTERY. ORAL IRRIGATOR: 3 operating modes – Normal, Soft and Pulse floss to meet various oral care needs. Safe and effective flossing between dental braces, gum, teeth and even remove bad breath. SAVE TRIPS TO DENTIST: using water flosser device is especially important for those with braces to remove buildup around brackets and wires. Perfect for adults and kids for more thorough clean than traditional string flossing. Provides an easy and effective way to proper oral care for teeth and gum health at home. 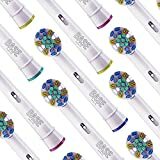 1 Handheld Water Flosser, 1 USB Charging Cable, 4 detachable 360°rotating nozzle, 1 BONUS Stainless Steel Hygiene Tool Kit and 1 YEAR WARRANTY. – Compact & Portable for travel, business trip, office, home, dorm room. – Water pressure from 40-120psi with 1700 pulses per minute. Powerful water jet helps remove up to 99.9% of plaque from treated areas, promotes a cleaner mouth and prevents bad breath.